With 5 locations in and around Boston, Salvatore’s is the destination for the best Italian food outside the North End. Salvatore’s Restaurants was created by Sal Lupoli, known for his Sal’s Pizza empire, and is the result of Sal’s and his undying passion for high quality, authentic cuisine at an unbeatable value. Unlike the pizza stores, Salvatore’s is a full service restaurant complete with private dining rooms, full bar and a warm ambiance reminiscent of the Lupoli family’s Italian roots. Situated directly between the Opera House and Paramount Theater, Salvatore’s features classic menu favorites as well as Express Dining options for guests with limited time to make the show. Attention to detail was missing. We were a party of 4 but table was set for two, we had to ask for fork, knife etc. when food came had to wave down waitress for cheese, salt and pepper. Everything was great but it’s very loud and it’s hard to carry on a conversation. We were seated right away for a reserved time. Waiter very kind and professional and accommodating. My husband ordered off the menu and they accommodated his request. Informed waiter that we were pressed for time and he delivered greatly. Perfect place to go before the theater. After several nice outings at Salvatore's, this week's visit was most disappointing. The food took an hour (we told our server we had theatre tickets), two of the three meals were burned, and the pasta dish was undercooked and the pasta clumped together. Our server apologized and comped the meal. Food was good. Waitress was slow and forgot to ask if we wanted drinks. Little noisy. When we arrived at Salvatore's they had no record of my reservation. Luckily, I had a reminder from you guys on my phone. The place was jumping and everybody was having a nice time. And it was very crowded. Luckily we were able to get a table but I must say I really felt the hostess's attempt at intimidation. We were waited on promptly. Our server was friendly, gracious and professional. I ordered risotto which I had had the month before and thought was excellent. Unfortunately, the risotto was more like a rice soup this time. My friend's hamburger was fine, no problem. We were eating before theater. Our meal was unusually slow coming out. Because of the long wait for our dinner we had to pack up most of it in order to make the show on time. I have to say that if this had been our first experience there we probably would not go back. Any place can have an off night . Our hostess needs to learn how to be more gracious. We love going to Salvatore's before each play at the Boston Opera House! It's our favorite place! We had dinner here before the theater. The service was friendly and informative. It was very busy but our server kept us informed on our orders progress. No one rushed us at all. Dinners were delicious. I had the risotto dish. My husband had steak tips. We shared the hummus platter as an app and it was good. Delicious hummus! The noise level is quite high but we adjusted. This was our second time here and will return. It’s a worthy option. I have never written a bad review, in fact I rarely write reviews unless our experience is exceptional. Unfortunately, from the moment we arrived to a table that was cleared but not wiped clean and had sauce rubbed into it that stained my husband's shirt, we were hoping things would improve but they did not. The hostesses were young and inexperienced and seemingly no one took issue with the fact that they were inappropriately dressed and were on their cell phones most of the time. The appetizers were tiny portions and by the time the waitress checked on us, it was too late to order more. The main courses did not impress and were not finished by any of us. This was more like cafeteria dining but for upscale prices and it was a tough bill to pay. That night two of the four of us got sick to our stomachs and this was our only food of the night so that was the last straw. The location is great for theater tickets in that neighborhood but I really can't say anything else positive about the experience. I'd suggest picking a different restaurant on the theater's list. Too expensive for what you get. Hated the sauce on the chicken and eggplant parm. Noodles not cooked. Not great. Salvatore’s is a terrific restaurant for lunch or dinner. The waitstaff are welcoming and offer excellent service. The menu has many delicious dishes. It offers excellent quality for reasonable prices. One of our to go places before a show. We have always had great service and the food has consistently been really good. Definitely recommend. Pizza was excellent and salad was very good too. Nice large portion. Had a terrific dinner and drinks at Salvatore's Saturday night. Our server was knowledgeable and friendly, the menu had something for everyone (vegetarian, gluten free & carnivore's) and the drinks were great!! The service was excellent and the food was amazing. The service was fantastic, their menus are easy to read and understand. I ordered a specialty from their drink menu and it was quite tasty. The food was very good and our waitress was extremely nice. We weren't rushed to finish and leave so that made for an enjoyable night. Excellent service & food, very convenient for theater guests. Highly recommend! The arincini appetizer and cappuccino were delicious. The meatball sandwich was just ok. Stick with pizza. Kale salad was right out of the bag with no prep at all. Prosciutto on Flatbread was a strange color and had to be scraped off....not fresh. Menus were also dirty. The plain cheese pizza ordered by the man next to us looked like the best way to go. Embarrassed that I suggested it to friends from out of town. We gave it a 2, a 3 and 3.5 out of ten. The restaurant itself was nicely configured. We had a delicious dinner here before the theater. The food (eggplant parmigiana and risotto) were both delicious. The wine list has a good selection and we were happy with our choices. The waitstaff was awesome, friendly, funny and attentive. We will return! Great value, great service !! Great place to go !! A nice family meal before a show at the Opera House. Variety of ages at dinner and there was something for every taste at the table. Drinks, apps, and dinner were all on point. Proximity to the theater was perfect! 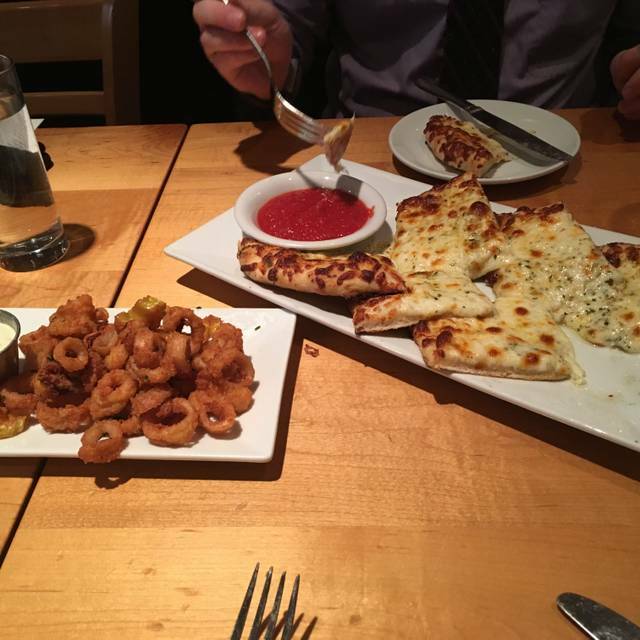 My friend and I usually dine at Salvatore's, conveniently located right next to the Opera House, when in Boston for shows.The food is consistently excellent, and we never leave hungry. The restaurant is usually filled to capacity, which makes the noise level somewhat high, and also results in the service occasionally being on the slow side. However, the servers are unfailingly cheery and ultra helpful. If you're a pasta lover, you can't go wrong with the bolognese, and the seared scallop entree is perfection. Would I recommend this restaurant to friends? I have, several times, and will continue to do so. Great spot. You can’t beat the location if you’ve got tickets to a show at the Opera House. Service & food are consistently good. The food as always was fantastic! Service outstanding. I brought my two teenagers here before seeing a show. They are hard to please... they loved it! The food was delicious, the atmosphere was cozy and the wait staff was prompt. It was overall a great experience and would recommend it! I asked for booth seating in my lunch reservation for two. Upon arrival, we were seated a row of table placed too close together (typical for most restaurants these days). I asked to be seated in one of the open booths and I was told they were limited to parties of three. Of course, that booth remained open for the entire time (1+ hours) we lunched and two other booths opened and remained opened. The restaurant should have emailed their policy in advance given my request in the reservation. This is another reason so many restaurants are failing. And...the food was average. The restaurant was clean and we appreciated the touch of having a curtain blocking the cold air as people entered through the front door, especially as we were seated close to the door. However, we were extremely disappointed with the quality of the food. My wife ordered chicken parmesan. When she received her meal the pasta was cold and tasted like it came out of a box from the grocery store. The sauce lacked any flavor and the chicken had an unpleasant texture. I ordered steak tips which were just ok and were served with fries that I can almost guarantee were from a freezer bag. When I make a reservation at a fine dining establishment, I expect to have a better quality meal than something that tastes like I prepared myself at home. The food was average. It was presented well and was good but only average, nothing special. Perfect choice for before the show.